The long running American Death Metal cult ACHERON, lead by Vincent Crowley has just released the video for the track ‘Satan Holds Dominion’ off the band’s new release “Kult Des Hasses”, released by Listenable Records. A fierce and dark atmospheric track with a video, that gives a good view into what ACHERON is all about, do give it a look and listen. My favorite album from the guys is with no competition “Anti-God, Anti-Christ” followed by “Lex Talionis” though the old demos and the first album do also work for me, and I have to say, the newer albums do win with the amount of listens they are given. 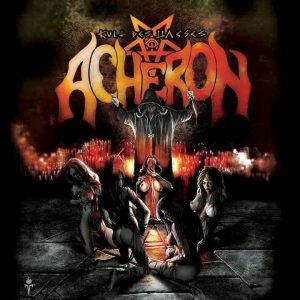 If you like your Death Metal dark, atmospheric, aggressive and satanic, then ACHERON is your band!